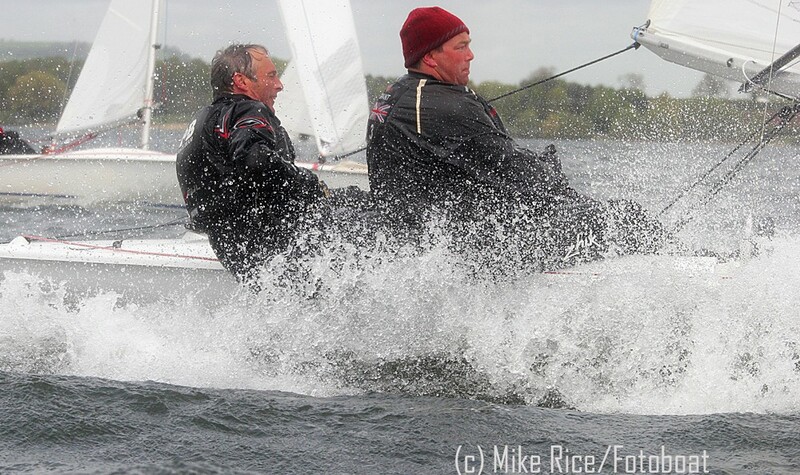 The best way to take half a dozen FFs to the Europeans at Garda….!! Garda is a fabulous spot – have you been? It’s spectacularly lovely …. but a blinking long tow. Plus I think you have to have one of those stripey square signs on the back. 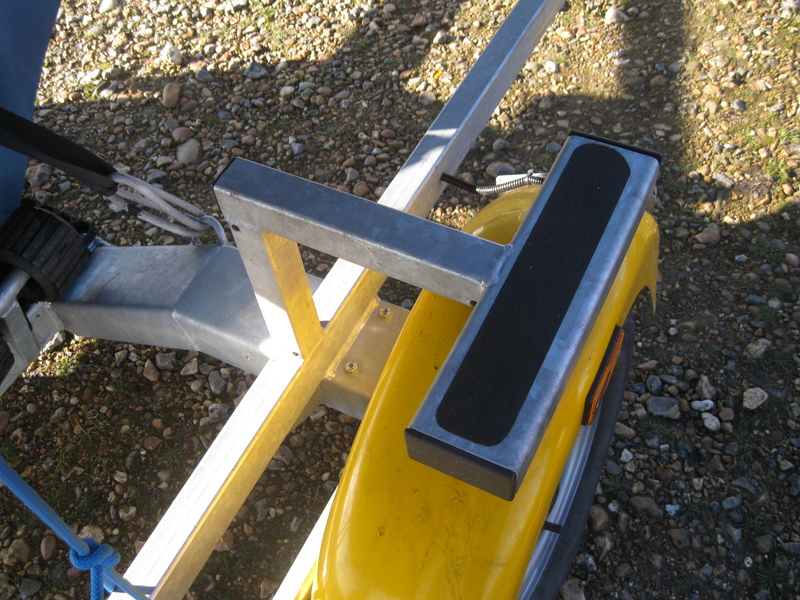 Trailer Welding on the Go…. !! Mervyn Wright had his trailer crack open at a weld at the Hayling Bulwark last weekend – and amazingly got it welded there!! First photo shows you where the crack is ! Regarding trailer boxes, there was a Spanish boat (3796 ?) around a few years ago that had some large diameter pipes fastened to the trailer frame. A bit like the things you see on the plumbers vans, but probably a foot or so in diameter with screw on ends. You could easily fit a main and genoa in each side. (from the Editor – I attach a photo of my Dragon ready to tow to show what you can get up to with trailer boxes once you decide not to submerge it for launching. Maybe our crane-lucky colleagues in Australia are already doing more with trailer boxes…?? 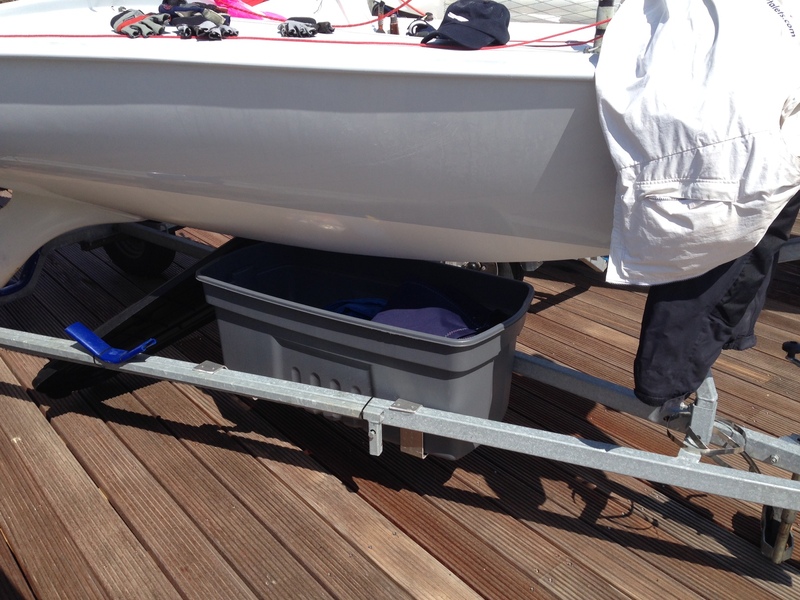 A great thing with Dragon Trailers is the special storage boxes that get included in the frame – great for storing sails and all sorts of kit. I loved mine. This is the first one I’ve seen on an FF Trailer – John Corby’s I think. How to Tell the Age of a Trailer Tyre….!! 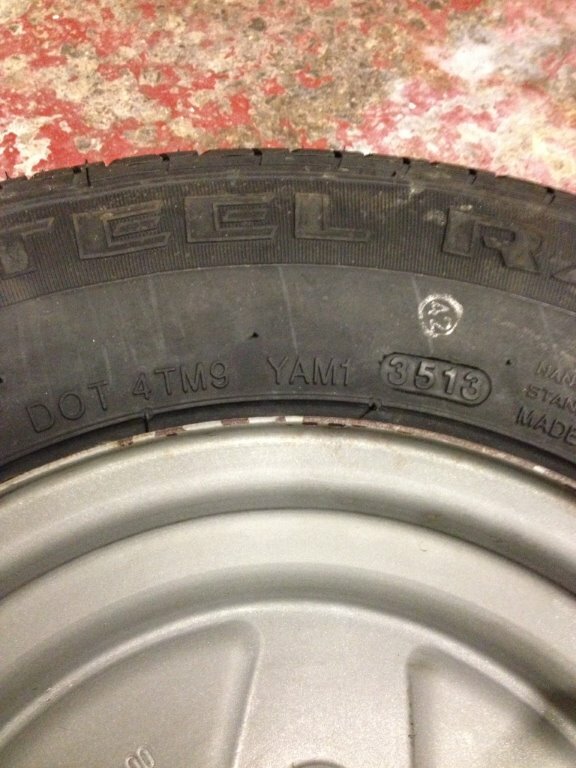 To date a tyre, first find the code DOT then some letters/numbers then in an oval four digits, in the photograph DOT 4TM9 YAM1 (3513) this indicates the tyre is 2013 tyre. This will be easy to find if the tyre has been properly fitted with the DOT markings on the outside! If your tyres are over 5 years old then they will likely perish, let water in and the steel bands will break causing the fault in the previous pictures. The best outcome is vibration and a tyre change, the worst outcome is a blowout and an upside down flying fifteen! 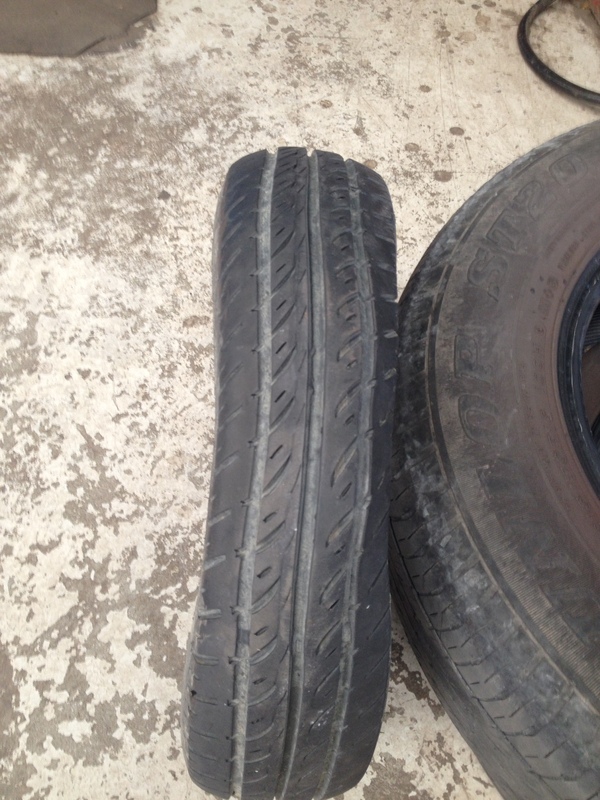 Trailer Tyres Have a Five Year Limit ….!! A new problem showed up with the trailer on the way back from Grafham, a really bad vibration started about half way home, thought the trailer was going to shake itself to pieces. So we pulled over on the hard shoulder and took a look, nothing doing, no problem with bearings we could see. We proceeded, slowly, to Stafford services, and stopped to have a proper look; we took a wee while to notice but just on the inside of the tyre we could see the tyre had become deformed. With the wheel off and it looked really bad, the spare was fitted and home we went. I took the wheel to our local tyre and towing centre, David Greenbank in Kendal, our man said “ah the tyre is out of date, they only have a life of 5 years this is. 2001 tyre”. Apparently the tyres perish, water gets in and the steel radial bands deform; “been launching your boat in salt water” our man said, “might have” I said looking sheepish! “Oh that makes it much worse” he said. Any way we could have had a blow out! Moral of the tale, change your tyres every 5 years even if they have tread on, and you can check the date by reading the code on the side. 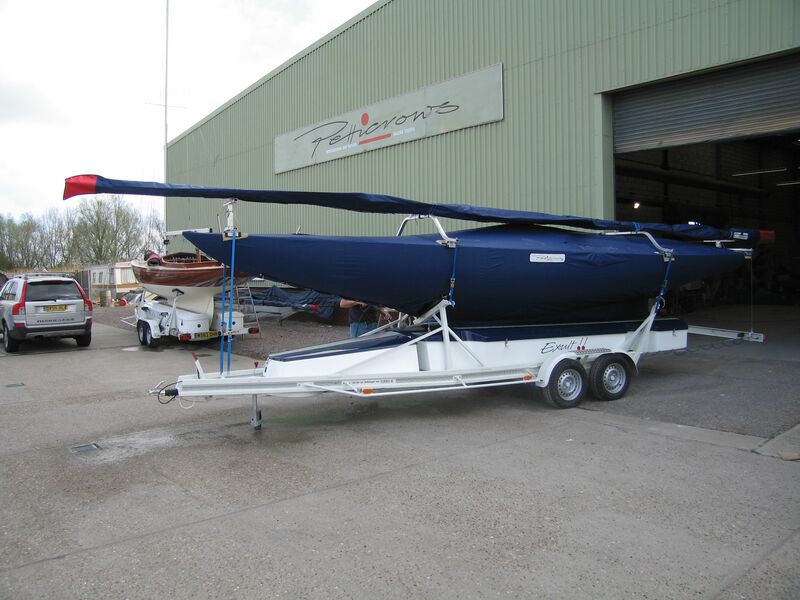 If you are new to Fifteens, or thinking of buying one, we find that most people are slightly wary about launching and recovery – especially if they are moving up from Dinghies. The good news is that it’s all a piece of cake. The majority of clubs use jetty launching – and the whole routine is surprisingly easy and DRY !! You just need to know a few tips on setting up your trailer, and the new video on the FF Insight Zone will show you the basic ideas you need to get going. You’ll find the video in the Members area of the BIFFA website. Go to the website home page and click UK Association/Members/FF Insight Zone. You’ll need your members password to log in first. I find the new Sovereign trailer fantastic. I have made a few mod’s but out of the box (or container in my case) I have been very happy with it. I am used to a Shand trailer made here in Victoria. 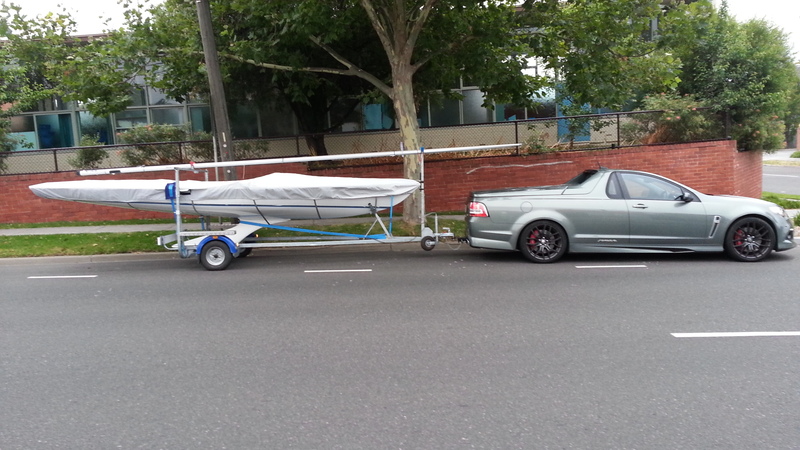 It was certainly a more heavily built trailer, but hindsight would suggest over built. It was heavy to wheel around by myself in the yacht club yard, it always required a rear prop to stop it tipping if I was in it and from memory had quite a bit downward load on the towball, but it did tow well. My new Sovereign balances beautifully. Its tow ball weight, while seeming light, proves ideal when towing. To this point I haven’t felt the need for a rear prop while un-hitched when I may be in the boat. 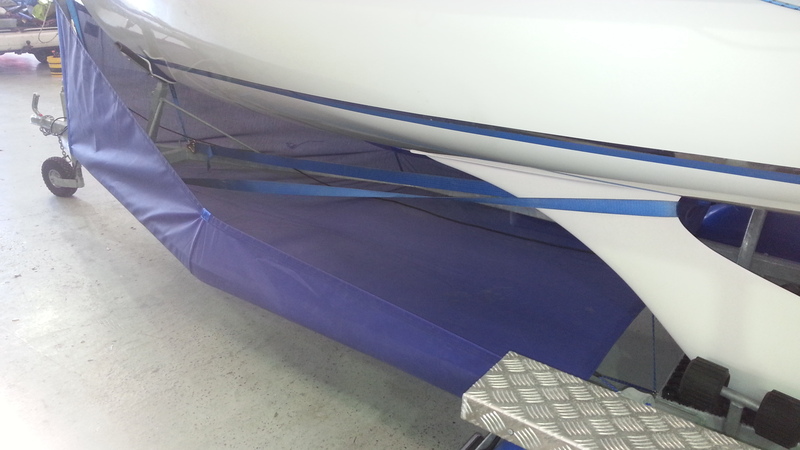 I am currently building a stainless keel clamp to do away with the two blue webbing straps as seen in the attached photo. Apart from thinking to myself, “those yellow mudguards have to go!”, the first thing I did was order & fit some alloy checker plate side step extensions. When wet, those as supplied are ideal to slip off and skin your shin’s. The next was to order a blue mesh trailer bag. 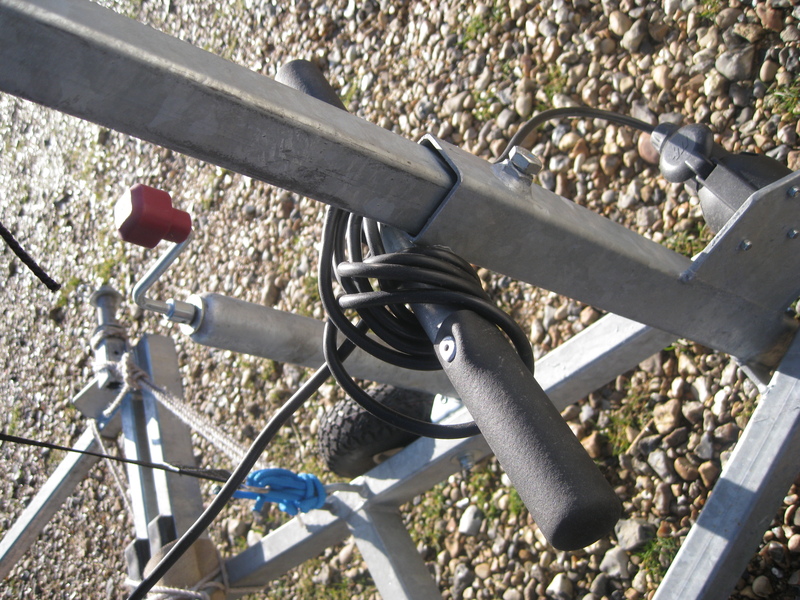 I also have a stainless keel clamp on the go to replace the two heavy blue webbing tie down straps. More on the New EU Sovereign FF Trailer…..!! A new Sovereign FF Trailer turned up at the Midwinters at Datchet and we were able to grab a closer look. It was very nicely finished by the way. The number plate bearers were capable of being drawn back, but not to within metre of the transom. Of course, the trailer was homologated without an FF loaded on so who would know. I would guess these will get discarded and we shall all stick with our transom light boards until the EU Police catch up with us!! You can just see the protective keel rollers at the top of the photo. The trailer’s sidesteps were great! A good non slip surface and attached to a horizontal bar given effectively increased stepping surface. I think the sidearms were shorter than the old model, so correspondingly for mast-roof clearance adjustment, you need some adjustment of the front mast support which you can see here. Clumsily, I should have taken this photo from the other side, but you can just make out the forward socket unit where the permanent wiring on the trailer meets the temporary wire running to the car. Blog readers will have seen these permanently wired lights before. Seems a leap of faith in submersible electrics at the EU office…. By the way, overall weight seemed at the same kind of level as the previous model. It looked like the axle beam may have been generous inverted U section instead of box section, which would have helped. Many thanks for all the information and photos on the new Sovereign trailer which looks to be a well designed piece of kit with lots of interesting details. I have an ‘old style’ Sovereign trailer and comparing it with the new one there are a couple of points which I would be interested in further information. 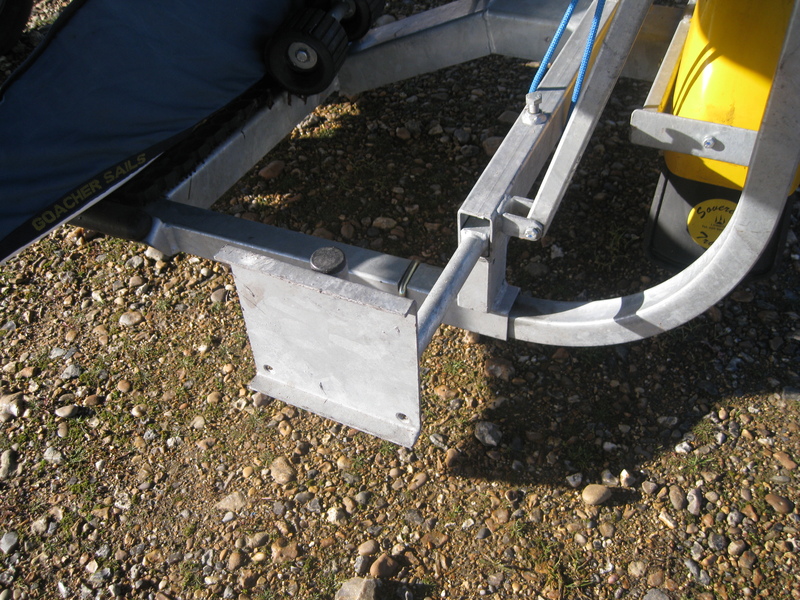 Firstly the keel rollers (great idea) have displaced the loops for the ratchet strap much further out, so will this mean the angle of the strap is now too shallow to get a good downward pull to lock the keel in place? 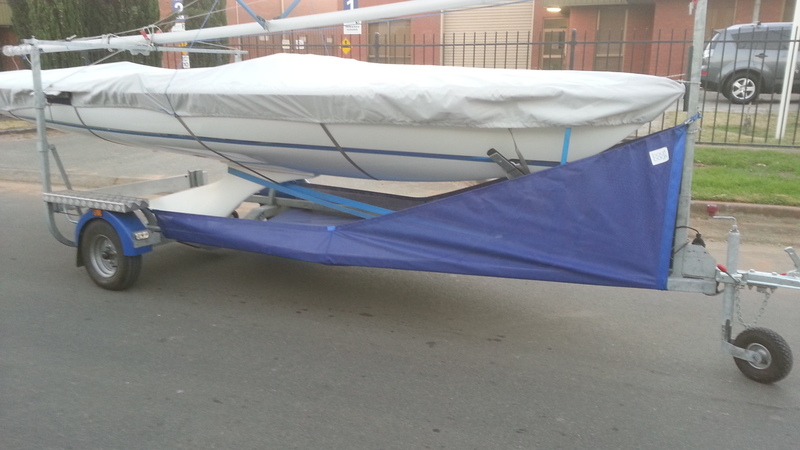 I like to strap the keel rather than the boat so as not to put pressure on the hull. 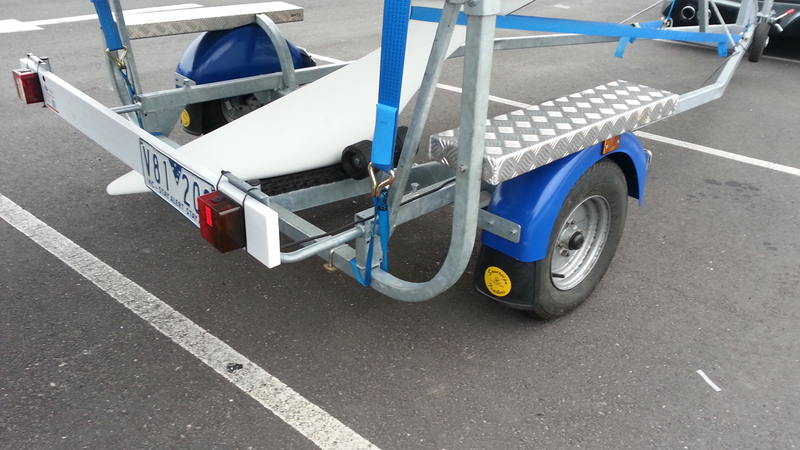 Secondly, my trailer is very nose heavy, placing a lot of load on the ball hitch. 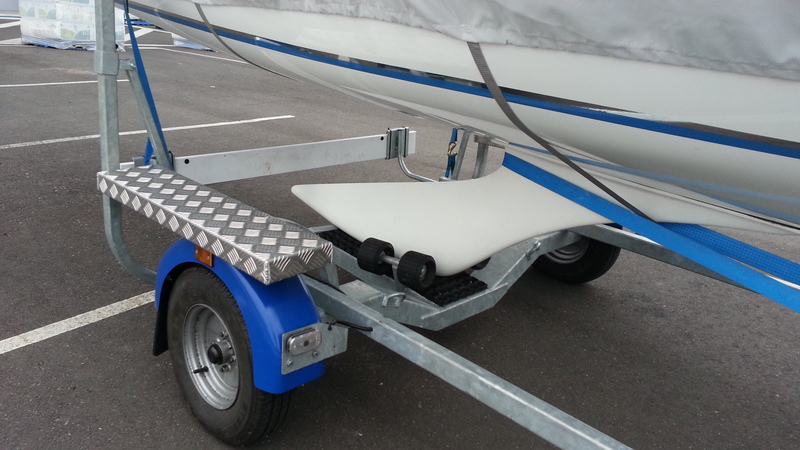 Whilst some load is necessary for good towing stability, I wonder if the new design is a bit better balanced with a more moderate load on the jockey wheel and ball hitch whilst retaining enough weight to stop the boat tipping up when launching down a steep ramp? David Hume on The EU Trailer…..!! 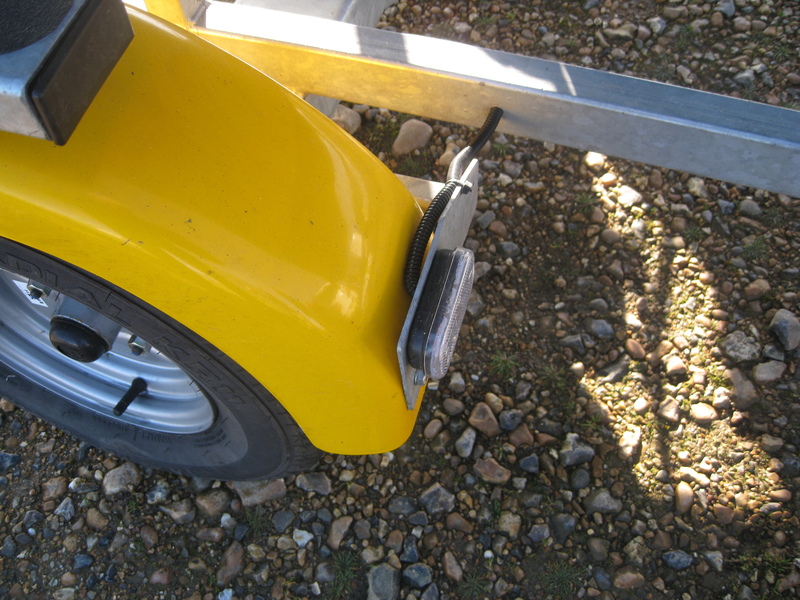 The lighting board shown in this picture is attached to the rear protection system of the trailer. 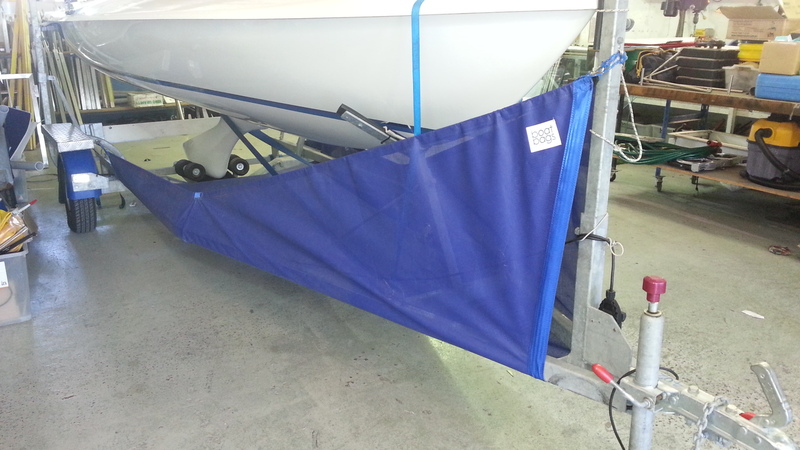 This protection system is both adjustable and demountable, the latter being essential if you intend to launch your boat from the trailer and not use a crane. The Road Vehicle Lighting Regulations 1989 stipulate that any rearward overhang from a trailer lighting system must not exceed 1Metre. 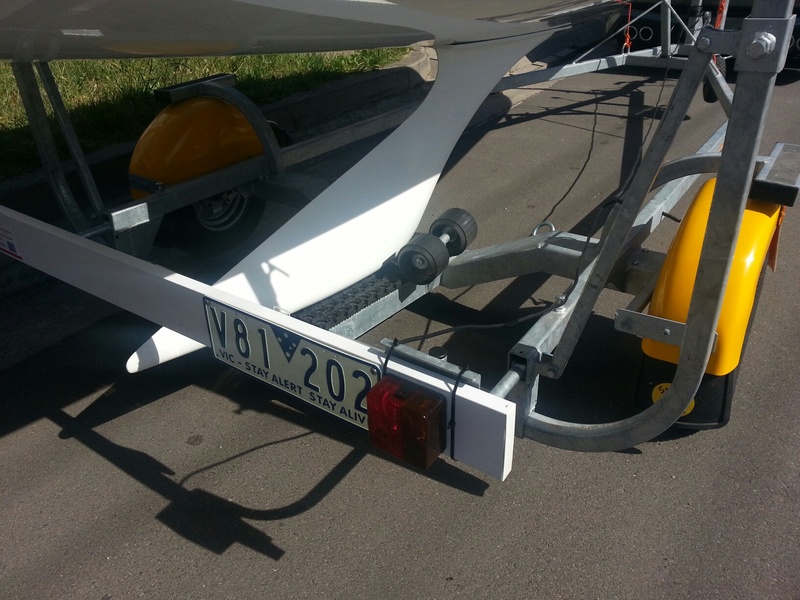 Therefore if the rear protection system , with lighting board attached, cannot be adjusted to meet that stipulation then a lighting board will require to be fitted on the transom of the towed boat, or bow if it is being towed t’other way about. BIFFA HQ on EU Trailers…..!! 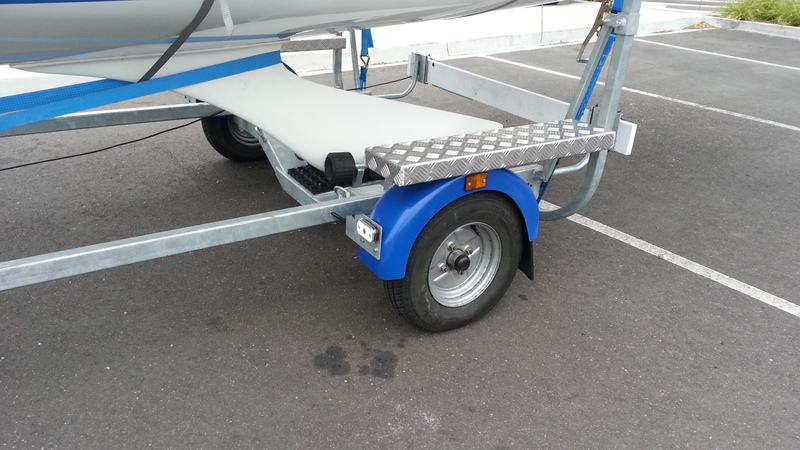 Interestingly there is a clause in the EU legislation that allows certain aspects of the new requirements that don’t have to be put in place ” if the trailer is used to launch the boat”. I wonder if trailer builders have a) ignored this b) missed it or c) decided it’s too difficult to apply for two type approvals one for trailers that launch and ones that don’t!